Tru Tech Doors, a leading manufacturer and designer of residential steel doors, fiberglass doors and door glass, is pleased to announce the appointment of Mr. Philip Orsino as its new Chairman. With over 30 years of millwork industry experience, most notably as President and Chief Executive Officer of Masonite International Corporation (1984-2005), and Jeld-Wen Inc. (2011 – 2014), Mr. Orsino has developed a well-earned reputation as a top performer within the industry. Mr. Orsino will continue in his other advisory roles as Director of The Bank of Montreal, Hydro One, the Minto Group and the Toronto General and Western Hospital Foundation. 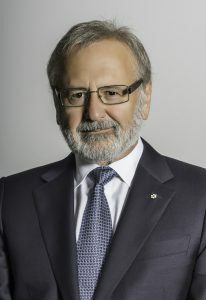 Philip’s other notable accomplishments include appointment as an Officer of the Order of Canada in 2004, recipient of the 2003 Canada’s Outstanding CEO of the Year Award, and the University of Toronto’s Rotman School of Business Distinguished Business Alumni Award for 2002. He is a Fellow of the Institute of Chartered Professional Accountants and is the author of ‘Successful Business Expansion: Practical Strategies for Planning Profitable Growth,’ published by John Wiley and Sons. Tru Tech Doors is a leading North American manufacturer of high quality entry door components. Since 1998 Tru Tech has designed, produced and distributed a wide range of steel and fibreglass door panels, decorative glass and other door related products for the residential and new construction building markets.